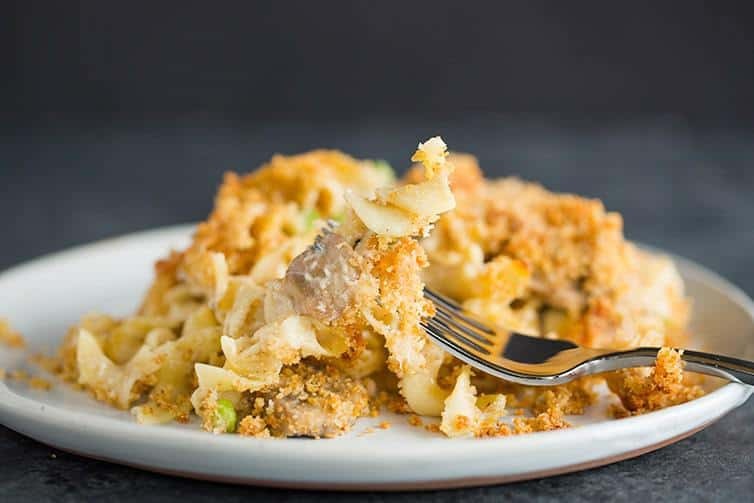 This classic turkey tetrazzini recipe is creamy, cheesy, and full of noodles – a perfect way to use up Thanksgiving leftovers! The countdown to Thanksgiving is officially on! I cannot believe that it’s only a week from Thursday… it totally snuck up on me this year! I’m totally ready for my kitchen to be a hot mess of pie crust, cranberry sauce, stuffing, peeled potatoes, and a turkey ready to take a dip in some hot oil. I can’t wait to fill my belly with all sorts of deliciousness next week! It seems that no matter how much we manage to eat on Thanksgiving day, there is always an infinite amount of leftovers. The good news is, Thanksgiving leftovers take very well to reheating, making them easy to eat again and again. The bad news? There are only so many turkey sandwiches one can eat. It gets boring, fast. Luckily, we’re not relegated to turkey sandwich prison; you can repurpose that turkey in a ton of different ways. Previously, I’ve made my grandma’s famous Thanksgiving leftovers casserole, a turkey-rice soup and turkey pot pie. Those are all fabulous, but I have to say, I think turkey tetrazzini definitely takes the cake. I really can’t resist any type of baked noodle dish, be it baked ziti, macaroni and cheese, or something like tetrazzini. I also can’t help myself when it comes to picking the crunchy bread crumb and cheese-coated noodles off of the top layer. Shhh, if anyone asks, it wasn’t me! I won’t lie. I ate this tetrazzini for lunch and dinner multiple days in a row after making it. That’s sort of a big deal for me, as I tend to accumulate leftovers without finishing them off. Ask my husband about the sheer number of take out and Tupperware containers that threaten to take over a refrigerator. It’s downright scary. Not this time, though. This time I finished every last morsel and was seriously bummed when I realized it was gone. I secretly didn’t even want to share it. 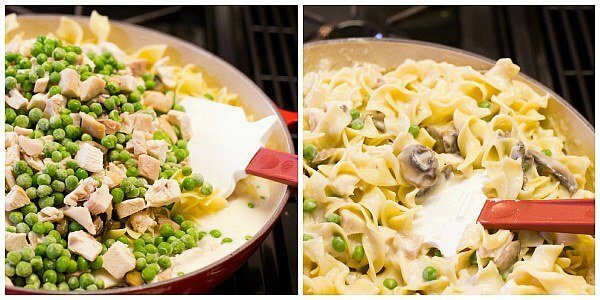 Between the noodles, the creamy sauce, mushrooms, turkey and peas, it was baked perfection. 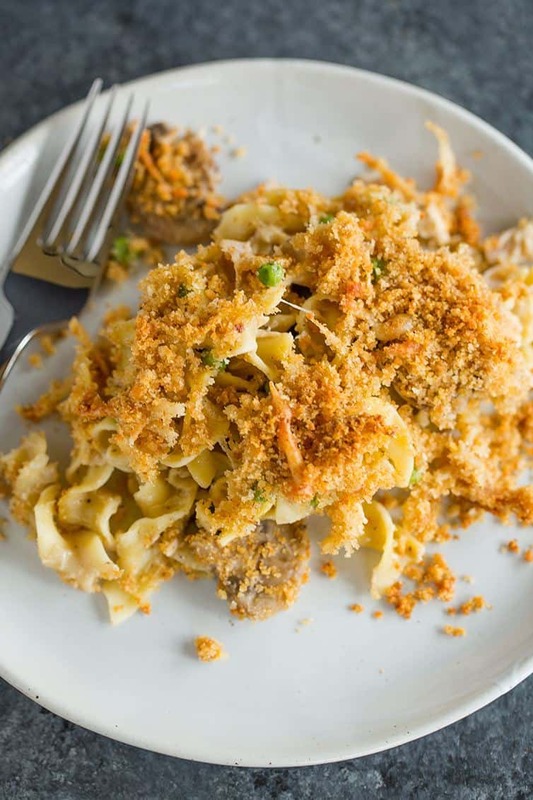 This turkey tetrazzini is a total no-brainer when it comes to using up some of that leftover turkey, plus, don’t throw away that almost-empty bottle of wine! You can use it in this, too! It’s the perfect dish to pop in the oven when you’re taking out all of the Christmas decorations; total comfort food. What’s your favorite way to use up leftover turkey? This classic Turkey Tetrazzini recipe is creamy, cheesy, and full of noodles - a perfect way to use up turkey leftovers from Thanksgiving! 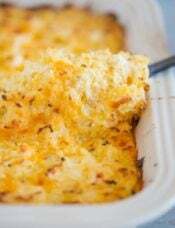 Preheat oven to 375 degrees F. Butter a 9x13-inch baking dish; set aside. Fill a large pot with water and put it over high heat to boil. In a large, 12-inch skillet with sides, melt 3 tablespoons of the butter over medium heat. Add the mushrooms and cook, stirring occasionally, until all of the liquid has evaporated, about 10 minutes. Transfer the mushrooms to a bowl and set aside. In the same skillet, melt 4 tablespoons of the butter over medium heat. 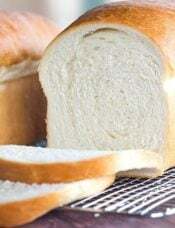 Whisk in the flour and cook, whisking occasionally, until the flour is browned and has a nutty aroma, about 3 minutes. While the flour cooks, add the noodles to the boiling water and cook to al dente. While the noodles are cooking, continue on with the recipe. Slowly whisk the milk, cream, turkey stock and wine into the butter/flour mixture. Bring to a simmer, then reduce the heat to medium-low and cook, stirring constantly, until the sauce is thickened, 6 to 8 minutes. Drain the pasta when it is finished, then add the cooked pasta, mushrooms, turkey and peas to the sauce in the skillet, tossing everything together until it is evenly coated. Add half of the Gruyere and half of the Parmesan cheese, stirring until the cheese is melted. Add salt and pepper to taste. Pour the mixture into the prepared baking dish. Melt the remaining 4 tablespoons unsalted butter. In a small bowl, toss together the bread crumbs, remaining Gruyere, remaining Parmesan and the melted butter. 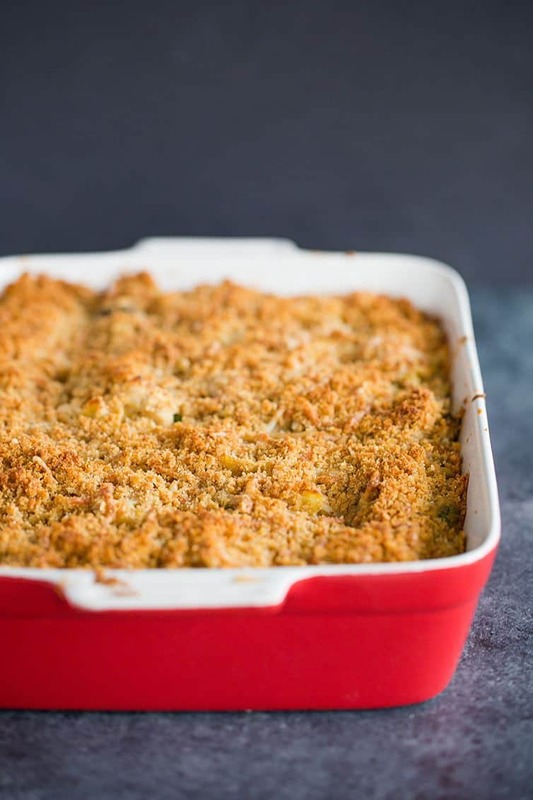 Toss with a fork until the bread crumbs and Parmesan are evenly moistened. Sprinkle the mixture evenly over the top of the tetrazzini. 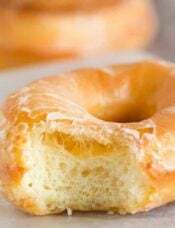 Bake for 30 to 40 minutes, or until the filling is bubbling and the top is golden brown. Let sit for 10 minutes before serving. Leftovers can be stored in the refrigerator in an airtight container for up to 4 days. This recipe was originally published on November 21, 2012. Can you substitute spaghetti noodles for the egg noodles? That’s the only way I’ve had Tetrazzini. Perfect! I have tried many tetrazzini recipes, but now I’m done searching. Was just in the mood for this dish, so I bought a rotisserie chicken to try it out. Everything came together easily. I generally don’t like recipes with so many steps, but to have tetrazzini, you must go through prepping the chichen, making the sauce, cooking the noodles, grating the cheeses, etc. It was so worth it. I used gouda cheese, instead of the gruyere cheese because of price – I wanted a melty cheese that wouldn’t impart a strong flavor or add color. The gouda worked well. I also made the casserole in the morning and held in the fridge until dinner. Finally, I cook to have leftovers, including frozen servings. This worked out nicely as both. I ate some leftover during the week (cold for breakfast!) . The frozen defrosted in the fridge and then warmed in the microwave. Husband and son agree – it’s a keeper! Can you prepare this the night before, and cook it the next day? This is the BEST Turkey Tetrazzini I have ever had! My family gobbled it up. Looks so yummy–I saw a whole turkey breast at Costco—do they taste like the whole turkey that gets roasted? I’ve never made one–and possibly this year this is what I will just make for myself and my furry babies. Holidays can be joyful for many, but not so joyful for others–letting the Lord make this joyful regardless and I do thank you for your TLC through your blog. You can tell you have a beautiful heart in how you love your family (all of them)–babies, doggies, and your extended family. You shower them with love through your care in your meals, cooking, planning, shopping. I know all too well how much work that can be–you “supp” with your family–what a way to show true love. Hi Macy, Thank you so much for the kind words, and I hope that you’ll have a blessed holiday season. I’ve never roasted just a turkey breast, but I think if you roast it just as you would a whole turkey, it would taste just as delicious! 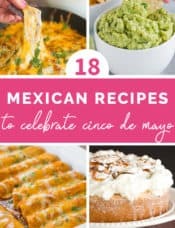 Coincidentally, I just saw this recipe pop up in my email and I saved it, might be a good one to try! http://www.recipetineats.com/garlic-herb-butter-roasted-turkey-breast/. This looks freaking spectacular. This is exactly the kind of meal that I would make by accident with Thanksgiving leftovers and, like you, eat it for days. Then, I would promptly never be able to recreate my accident again. Lost in the annals of “let’s throw a bunch of whatever together” dinners. Thank you. I have used it in other recipes – just not sure if it would work here. Any suggestion on substitutions for the heavy cream? What little research I have done indicated Heavy cream is 38-40%. I can’t find anything over 35% (whipping cream). Hi Bruce, You can use whipped cream, that would work just fine. This is a great recipe. I added raw chopped celery before baking. 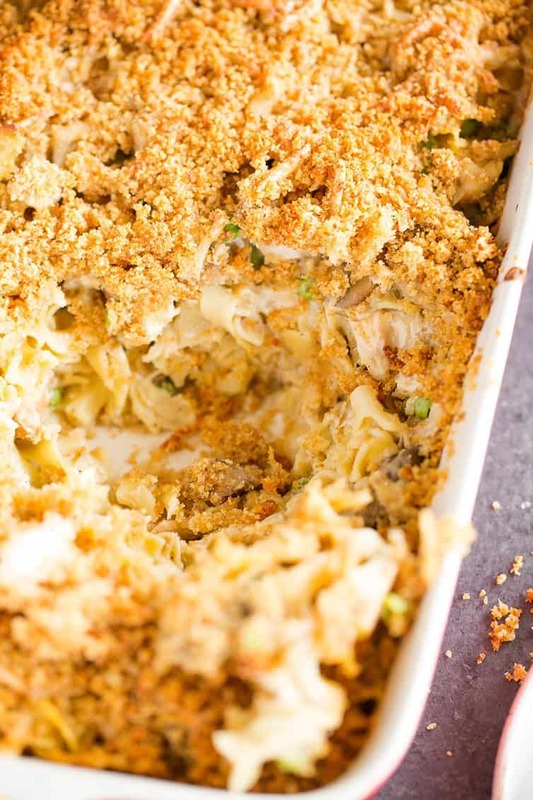 Love a little bit of crunch in noodle casseroles. I’ve made this for the last 2 years after I make a turkey around Thanksgiving time and it’s definitely going to be something I make for years to come! It’s so tasty and a great way to utilize the meat and stock. I always bake half and freeze half as an 8×8 pan of this is plenty for us for a meal and lunch leftovers the next day. It’s so nice being able to pull out the other half for a later meal like I did tonight! It reheats really well from frozen. I just put it right into a 350-degree oven and let it bake for about an hour and a half covered with foil, then I remove the foil for about another 30 minutes so it’s all heated through and nice and crispy on top. Great freezer meal! Thanks so much for sharing the recipe! I made this a couple weeks ago with my boyfriend. It turned out super delicious! We actually double the recipe for the bread crumb topping ;D Really recommend this recipe! Thanks for sharing! Turkey Tetrazzini was my favorite dish my mom would make. She didn’t make it often because it was so labor intensive. She gave me the recipe but I could never make it like her’s! She has now passed on (her name was Michelle too! ), and I’m always looking for new tetrazzini recipes to try. So many online are NOTHING like her’s (chedder cheese? spaghetti noodles? OLIVES??). I can’t wait to try this one. Looks delicious! The directions forgot to tell you what to do with the mushrooms.I added them in step 6 . I substituted a shredded 4 cheese blend, as buying the other cheese was way too expesive. Used Becel instead of butter, more chicken broth for wine, and corn for peas. It was great! It was still good reheated in microwave next day. This is our new favorite for a cold winter supper in Canada. Hi Gloria, The directions actually do include the mushrooms; they are added in step #2. I’m glad you enjoyed the dish! Gloria is right, though. The recipe tells us to cook the mushrooms and set them aside, but it does not say what to do with them AFTERWARDS. Give your readers some credit, we’re smart people. Step 6 says to add the mushrooms to the sauce. Please be kinder to Michelle. Was super excited to try this and was unfortunately dissapointed. Did not have as much flavour as I thought it would. Still quite nice. My husband and I both really liked this dish. Leftovers were excellent too. Will certainly make again, even for company! 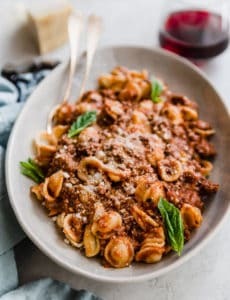 I made this recipe last night, the entire family enjoyed it! Thanks for sharing! I made this tonight with leftover smoked turkey from Thanksgiving and it was superb!! 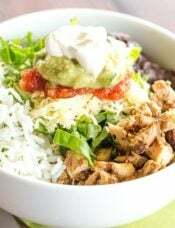 This one may have to go in my regular rotation with chicken as well. Thanks for such a great recipe! This is in my oven now. Can’t wait!! Everyone is running late for dinner, if they are lucky I’ll still let them eat. You should think seriously of writing, you have a way with words, not just foods. I’m a single widower, and leftovers are a way of life, if you like to cook. My containers go to friends, but the turkey tetrazzini stayed home, thanks. Happy Thanksgiving,Michelle. We’ve already done the turkey celebration in Canada, but I would do it all over again, it’s all so good. What a lovely dish! Makes me want to run out and buy a turkey just for the leftovers to have to make this. After seeing this, I’m almost *hoping* I get sent home with leftovers!! This is one of two favorites; it takes turkey to a whole new level; not something that tastes at all like a leftover. My other favorite? I can’t tell you how much I look forward to my favorite sandwich. Turkey, cranberry sauce, cream cheese, sprouts and sunflower seeds. It’s amazing; I seriously only make a turkey so I can make this sandwich the next day. Happy Thanksgiving! This looks awesome! 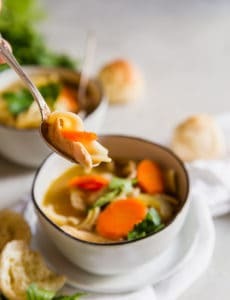 I’m thinking I will have to roast a turkey for all these amazing leftover turkey recipes I’m seeing everywhere, and this one is at the top of my list! I’m going to have a ton of turkey leftovers, and this recipe will be great for Friday night dinner!! Thank you for the recipe!! one of our favorite dinners as well! when we don’t have turkey leftovers, i make it with chicken. 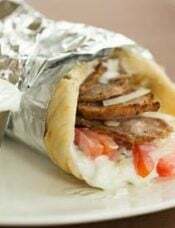 mmm i am craving some now! 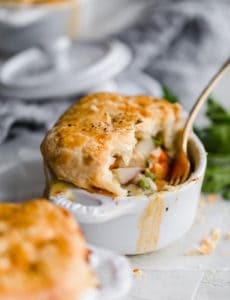 i also love doing turkey pot pies, or making turkey empanadas! hope you have a happy thanksgiving!